This Crustless Zucchini Pie Recipe is low-carb, gluten free and absolutely delicious. So, go ahead and have a second slice! 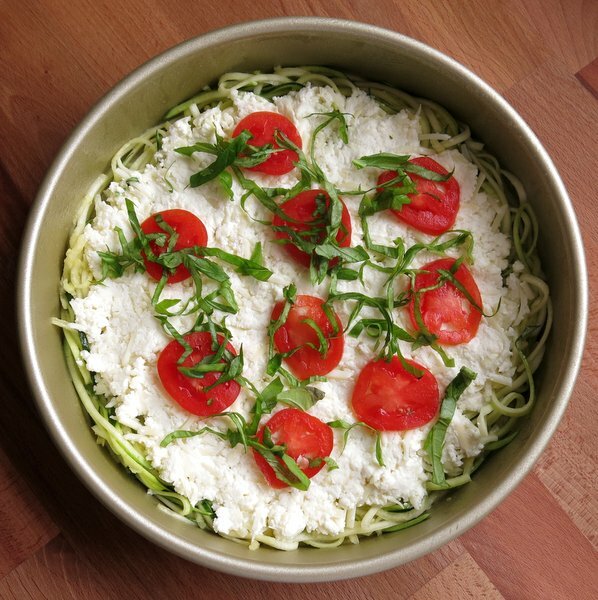 I love pasta and pizza…and my spiralizer. (And zukes. I love zucchini too!) So after having traditional Spaghetti Pie with my family one day and Zucchini Noodle Alfredo the next, Crustless Zucchini Pie was born. It’s easily customized with your favorite toppings, just like a pizza. But, it’s also a bit like a cheesy crustless quiche. So, use a fork when it comes time to eat. It’s an obsession a personal challenge of mine to sneak a good dose of veggies where they’re not expected (case in point Zucchini Brownies.) 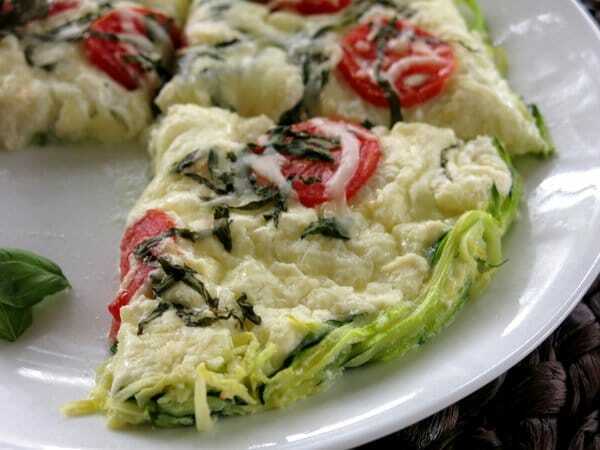 I’m particularly fond of swapping out the carbs in pizza, as in spaghetti squash pizza crust and cheesy cauliflower pizza bites. Once zucchini is in season, this is my go-to veggie-loaded pizza dish on pizza night! We recommend a spiralizer for this recipe. I got mine for under $20. It’s small and has greatly increased the consumption of vegetables in our house. Check out our Amazon store for brand suggestions if you don’t have one. 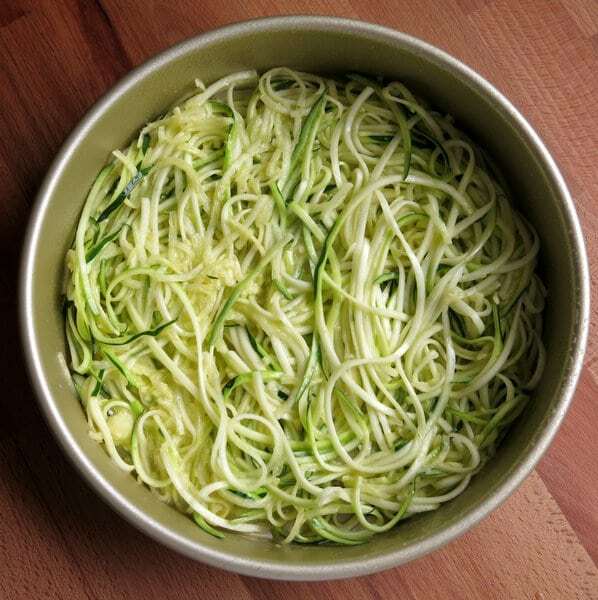 Spiralize a large zucchini to yield about 2 cups of noodles. Press out excess moisture, if necessary. Toss the zucchini noodles with egg and olive oil, then layer them in the bottom of a 9 inch round or square pan. If you’re ready to make this recipe tonight and don’t have a zoodle maker, then use a vegetable peeler to make zucchini strips like we did for Zucchini Ribbons Sauteed in Garlic and Rosemary. Or, chop the zucchini into uniform, bite-sized pieces! Variation: I’m whispering…you can also use half cooked pasta noodles and half zucchini noodles if your family is a little resistant to change! Next, mix the cheeses and garlic together and drop spoonfuls of the mixture over the noodles in the pan. Use your fingertips or the back of a spoon to spread it in an even layer, leaving a “crust” around the edge. Did I get you thinking? Sprinkle a little extra cheese over the top before it goes into the oven. Bake until the noodles have set. Once they have, we were able to easily slide this out of the pan with a large spatula. Slice it with a pizza cutter and enjoy! 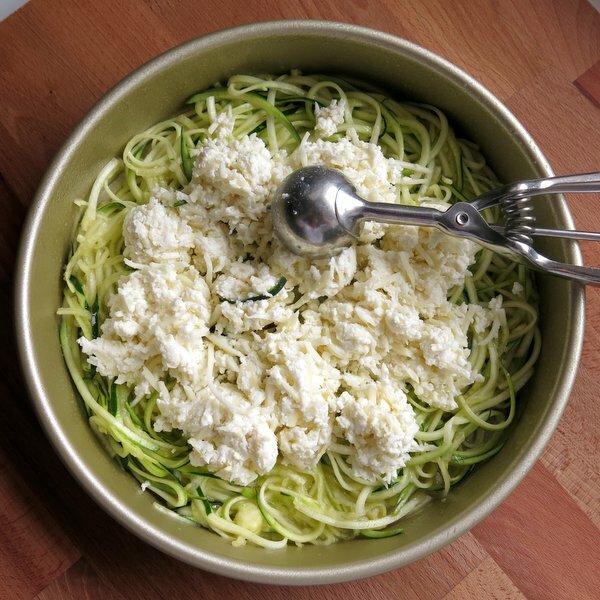 Make ahead tips: Spiralize zucchini ahead of time. Make the cheese mixture ahead of time too. Assemble the recipe just before cooking and enjoy! 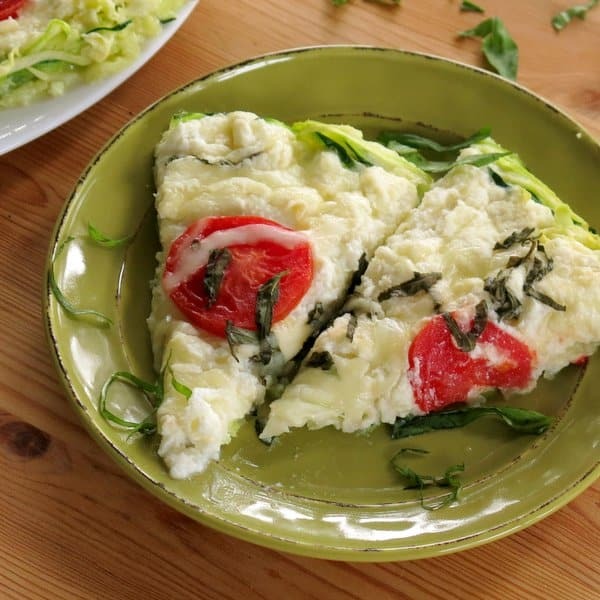 This Crustless Zucchini Pie Recipe is low-carb, gluten free and delicious. Customize with your favorite pizza toppings, and eat it with a fork! Layer noodles in a 9 inch baking dish that has been coated with non-stick cooking spray. Mix cheeses and garlic together in a small bowl. Place Tablespoon-sized drops over the top of the zucchini noodles, leaving about a 1/2 inch “crust” around the edges. Press cheese mixture down with fingers or the back of a spoon. Top with tomato slices, fresh basil and a sprinkling of Mozzarella and Parmesan cheese. Slice with a pizza cutter, but eat with a fork! Customize with your own toppings. Make ahead tip: spiralize noodles ahead of time and store in an air tight container in the refrigerator for up to 3 days. Blot wetness away with a towel before using. Use low-fat cheese (less than 6g of fat per ounce) to make recipe South Beach Phase 1 compliant.